Health systems are complex. They face constant change, including responding to new technologies, shifting standards of care, and increasing demands for more sophisticated care. They face multifaceted public health issues, such as mental health, the well-being of Indigenous peoples, substance use challenges, and aging populations (Naylor et al., 2003; Romanow, 2002; Truth and Reconciliation Commission of Canada, 2015). Adding to the complexity is the interaction of public policy with health administration. These challenges are occurring in the context of an aging workforce and continued challenges in staff recruitment and retention, especially in rural and northern regions. This complexity demands sophisticated, responsive health systems led by leaders with the knowledge, skills and capabilities to successfully guide change. The LEADS in a Caring Environment leadership capabilities framework (LEADS) was developed in response to the need for a Canadian approach to leadership in health. LEADS enables adaptive leadership, promotes distributed leadership and defines the leadership behaviours required by leaders and organizations to achieve their goals. 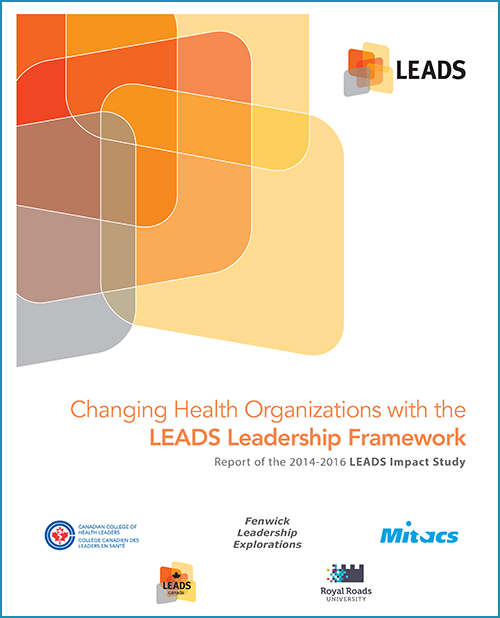 With LEADS being broadly adopted and integrated in health organizations across Canada, the 2014-2016 LEADS Impact Study explored the uptake of LEADS in five organizations to identify individual, organizational and system applications and impact. Many health systems across Canada have adopted LEADS in a Caring Environment (LEADS) as their leadership development framework; some are now looking for a complementary system that measures leadership effectiveness. Given the vision, mission and values of the Canadian College of Health Leaders, such a complementary system must be similar in approach to LEADS: leading edge and adaptive to the changing needs of health care organizations. This paper is a review of selected literature on critical influencers in the success of performance systems, which in turn influence organizational success. The discussion is informed by current literature on high performance organizations, performance and talent management, engagement, adaptive leadership, neuroscience and positive psychology in both the public and private sectors. The intention of the paper is to provide a systems view that can inform LEADS users who want a bridge between the development purpose of the LEADS framework and their needs to measure leadership performance.